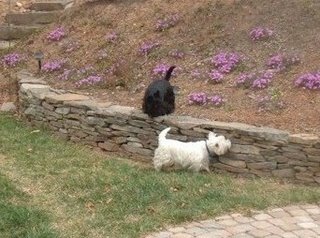 I made reference to a Westie and a Scotty in the previous post. I present to you Lexi Lou and Barney O'Kane, my four-legged "dog kids". Lexi (our Westie) has been with us since March 2001. Barney (our Scotty) has been in the family since June 2004. These two dogs have have been a constant source of joy and companionship. As terriers, they've had their moments and occasionally have shown the ability to try one's patience. Their pleasant disposition more than makes up for any of their terrier quirks. So, what can you say about little folk who are faithful, loyal, trusting, quick to forgive and not given to hold a grudge? Hmm... I might say that the Father may have created dogs to remind His kids just how to behave.